How Do You Get To Antarctica Without Crossing The Drake Passage? Without Crossing The Drake Passage? Despite the fact that visiting Antarctica had been on our World Travel Bucket List for years, we didn’t include the continent on our 2012 travel wish list for one simple reason: I suffer from serious seasickness that no combination of Dramamine and ginger could conquer. So how do you get to Antarctica without crossing the dreaded Drake Passage? When we got back to Punta Arenas after our time in Torres del Paine National Park, we received some bad news: The previous week’s Antarctica cruise had been cancelled due to 11cm of ice on the King George Island Airport’s short landing strip, and there was still too much ice on the runway for Antarctica XXI’s BAe-146 to land safely. The good news? 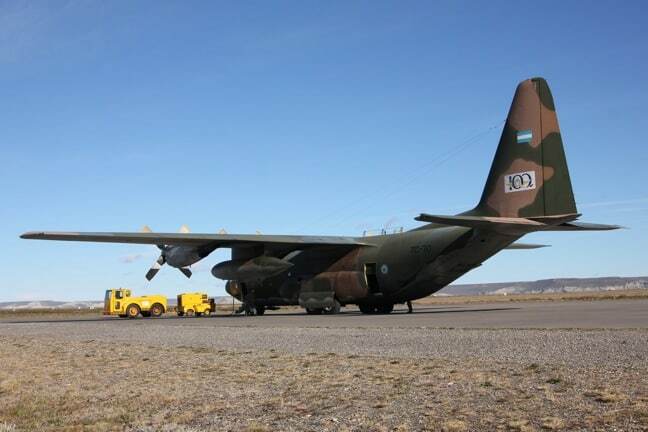 Rather than cancel another trip, the company had worked out an agreement with Argentina’s Air Force to fly us over in a Hercules C130– an agreement which required approval from the Office of Argentina President Cristina Elisabet Fernández de Kirchner! So we set out the next morning on buses, making the drive from Punta Arenas north into Patagonia, then east to the border of Argentina. We waited about 2 hours, as customs agents went through nearly 60 passports, before making our way to Río Gallegos, the capital of the province of Santa Cruz. After an overnight stay, we finally made it to Piloto Civil Norberto Fernández International Airport, where we watched as the Air Force airmen (and women) loaded our suitcases into the back hatch of the plane. 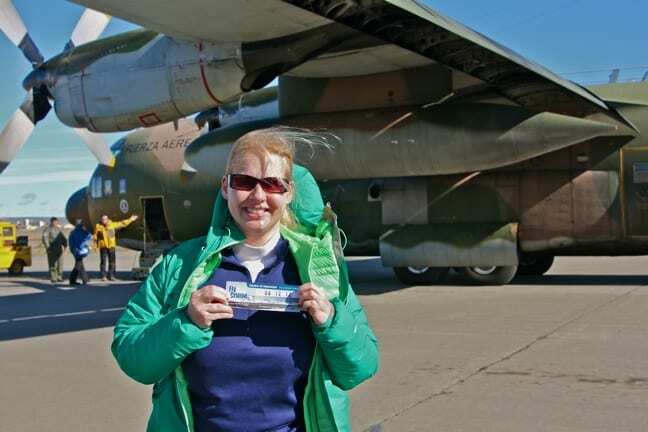 The energy among the passengers was extremely high, partly from our 24-hour delayed departure, partly from the once-in-a-lifetime opportunity to fly in a freakin’ military aircraft, and partly because we simply couldn’t wait to get to Antarctica. At one point, I thought our poor Antarctica XXI handlers might snap from the unrelenting pressure. Finally, after everyone changed into snow gear and waterproof Wellingtons (thankfully provided by the tour operator), it was time to board the Hercules. We had no idea what to expect, so I’m sure fairly certain our eyes were popping when we saw the knee-to-knee jump seats the airmen had installed for us. 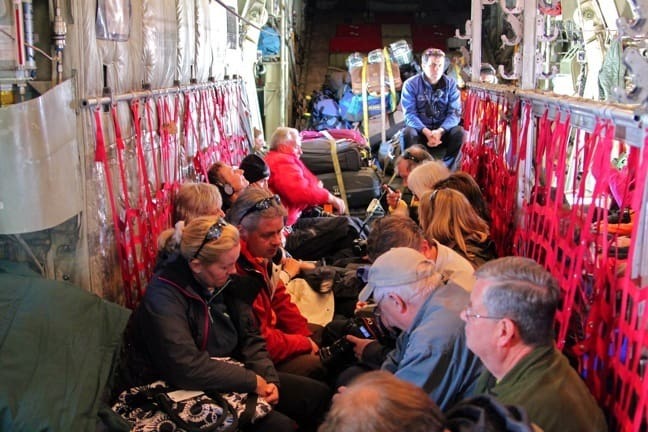 The cabin was buzzing with excitement as people strapped themselves in and took photos to document the unique experience. Having heard from our new friend (and fellow passenger) Jeff that these planes were extremely loud, Mary and I had brought earplugs for the ride, which helped lower the cacophonous din of the 4 massive turboprop engines to a manageable dull roar. 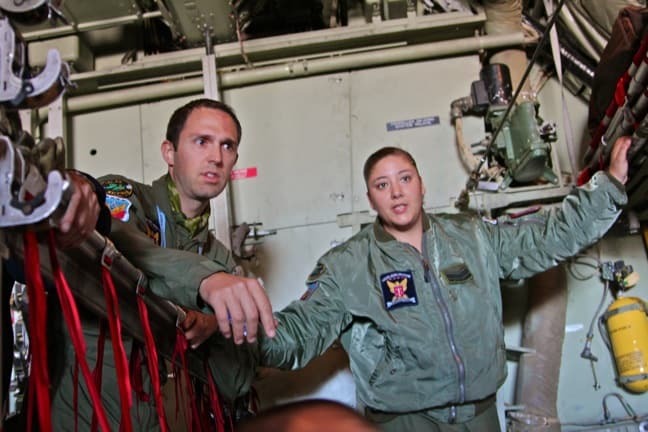 It was insane having Argentinean Air Force personnel as our flight crew, ushering us to our seats, helping us figure out the seat belts, and even passing out in-flight service. The day before, we’d gotten no snacks or drinks on the 5-hour bus ride from Chile to Argentina. But somehow, they’d managed to arrange for us to have 2-liter bottles of soda and snack packs to pass around on the Hercules! The entire experience felt more than a little surreal. It wasn’t the most comfortable flight we’ve ever taken. The gentleman seated next to me was practically in my lap, and the weird nature of the fabric jump seats meant you were usually off balance or bumping into the person next to you (and, in my case, behind me). But it was mercifully short– about two hours– and the coolness of the adventure vastly outweighed the minor inconveniences of being a day late to Antarctica. 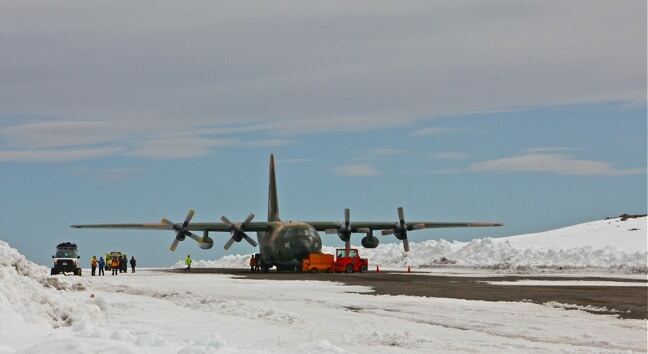 Finally the plane began its descent, and we saw the South Shetland Islands in the distance. Everyone started passing their cameras to those fortunate enough to be seated by the windows in hopes of getting bird’s-eye-view snapshots of the snow-covered islands, and craning their necks for our first glimpse of the icebergs that dotted the ocean. Finally, after four days of travel (one from Atlanta to Santiago, one from Santiago to Punta Arenas, one from Punta Arenas to Río Gallegos, and one to Antarctica), our longtime travel dream was about to come true! Our hearts were pounding in our chests as the plane touched down on the icy runway, engaged its powerful reverse thrusters and came to a stop. I couldn’t help feeling a little impatient as we grabbed our backpacks, walked down the steps and waited by huge snowdrifts for our fellow passengers to disembark.